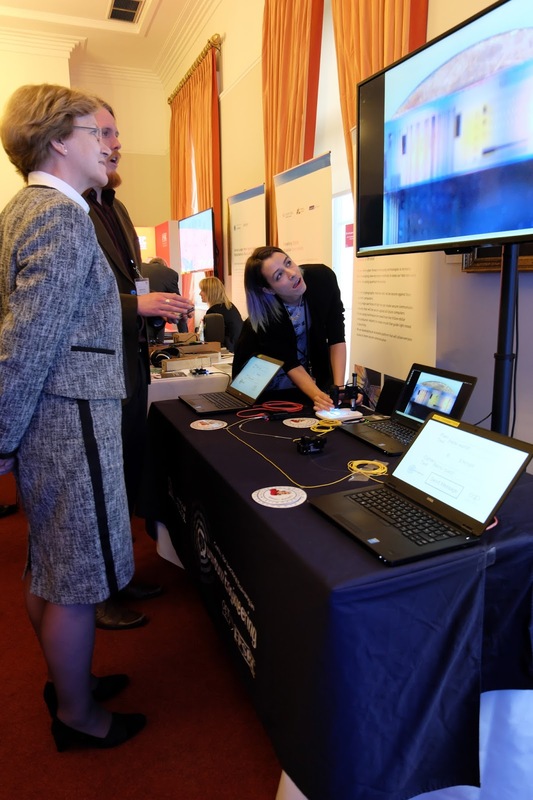 A blog by staff and students from the Quantum Engineering Technology Labs (QET Labs) at the University of Bristol on their experiences both in and outside the lab. 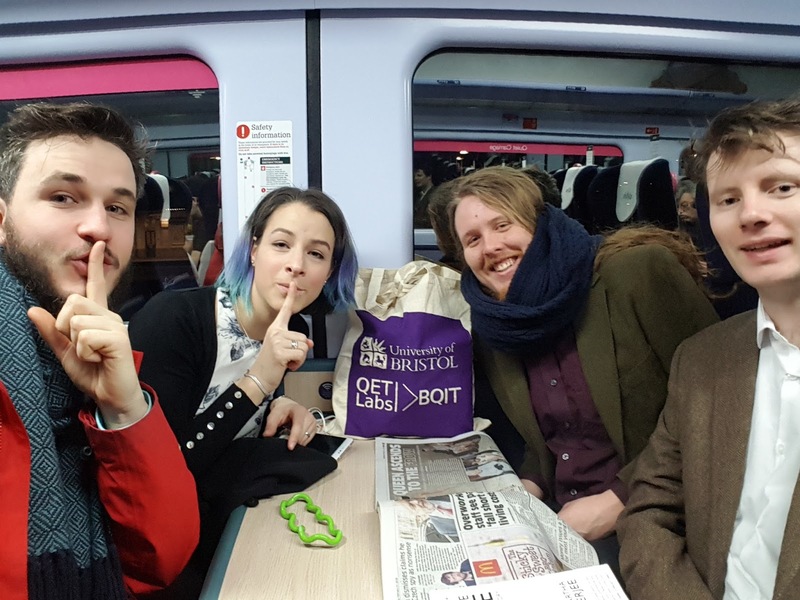 The outreach team were once again invited out of the lab and on an early morning training to London to present the latest and greatest in quantum engineering. After an early morning start, and accidental seat reservation in the quiet carriage, we arrived at the Royal Society to take part EPSRC's Science for a Successful Nation 2018. The event aims to showcase EPSRC's investments and demonstrate their social, cultural and economic impacts. Bristol University was well represented with stands from the Bristol Robotics Laboratory and the Jean Golding Institute. 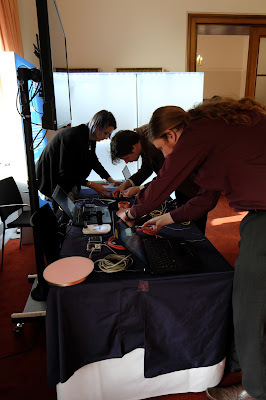 In amongst the exhibits were students from the Quantum Engineering CDT and QETLabs demonstrating the importance of data encryption in a connected society. By showing how readily data can be intercepted on network, it is easily seen that we need to invest in data security to ensure it's remains secure in the near future. 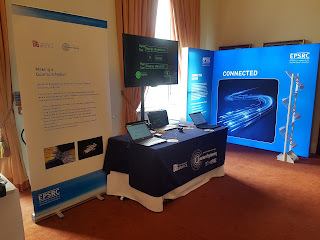 The event was well attended by EPSRC representatives and industrial partners. There were sessions throughout the day providing stimulating discussion that covered EPSRC's prosperity outcomes: A connected, productive, healthy and resilient nation. 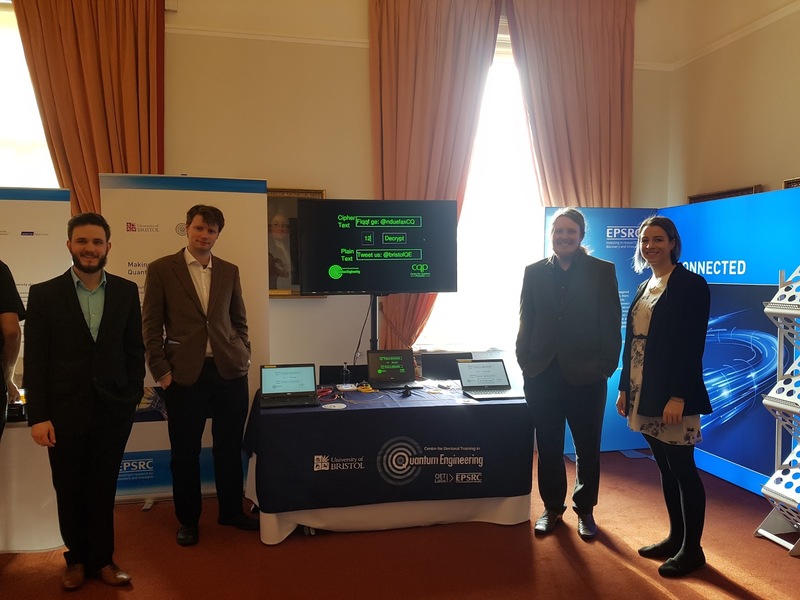 We would like to thank EPSRC for giving us the opportunity to present our demo and supporting our research! Bristol awoke in a thick fog on Friday morning, but by the time the first session was in full swing, we were back under the glorious BQIT sunshine, looking down on the harbourside from our venue, MShed. Kicking off the day was Val Zwiller of TU Delft & KTH Stockholm, giving a history and outlook for superconducting nanowire single photon detectors (SNSPDS), with an emphasis on the importance of time resolution - photon purity will appear much reduced if measured without appropriate time resolution! 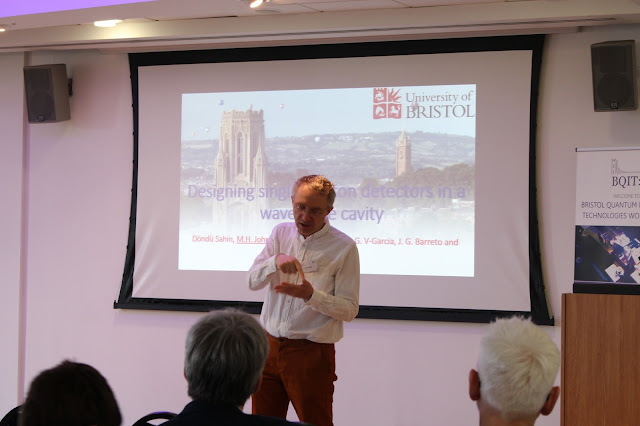 QET Labs' Dondu Sahin followed up with Bristol's plans for near unity efficiency, ring-coupled SNSPDs, which have the added bonus of precise wavelength tunability, and Anthony Laing (also from QET Labs), with his talk on photonic simulations of molecular quantum dynamics. QET Labs recently added new activities to their highly developed public engagement culture. Among them is Quantum In Conversation, part of the QET Lab’s award wining engagement initiative, Quantum in The Crowd (http://www.bristol.ac.uk/news/2017/october/engagement-awards-2017.html). Quantum In Conversation now reaches out to the children and young people of all educational backgrounds to engage with quantum research in the visual/narrative forms through the ‘Quantum PhoComics’ project. The project stemmed from the on-going collaboration between QET Labs and their Research Engagement Supervisor, artist and historian Dr Milica Prokic. 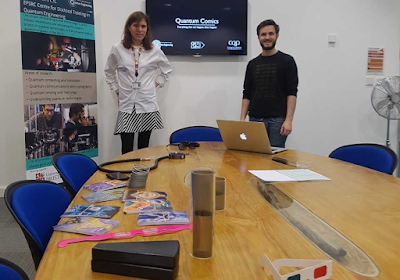 In November Milica teamed up with QET PhD researchers, Henry Semenenko and Alex Moylett, to deliver a quantum inspired comic strips workshops to young Bristolians. 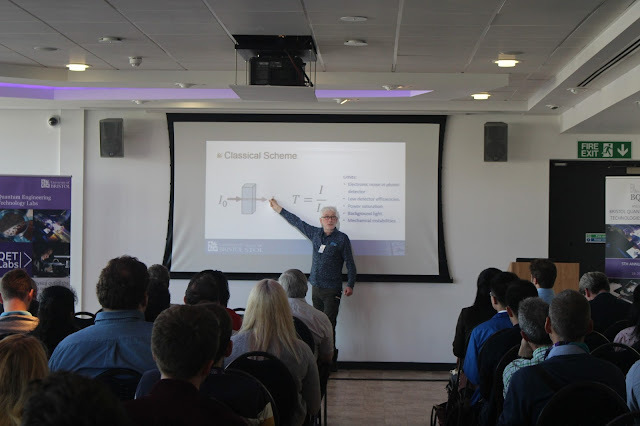 In accordance with the precedent set last year, the Bristol Quantum Information Technologies Workshop kicked off today at the M Shed with the start of what is forecast to be three days of glorious sunshine. The weather was matched by optimism in the days talks, which were spread over sessions in quantum communications, quantum theory, quantum photonics and quantum enhanced measurement and control. QET Labs director John Rarity opened the conference and gave the first talk "next generation communication networks", summarising QET Labs’ activity in the area. Chip scale QKD pioneered by KETS - a recent Bristol spin-out - was a highlight, as well as plans for a sub £1M QKD satellite mission. Next up, Christoph Marquardt of the Max Planck Institute of the Science of Light reviewed the state of QKD around the world, and outlined their plans to build global hybrid QKD networks, utilising satellites, drones, and fiber links.